Buying crickets in bulk will save you money and reduce the number of trips you have to make to the pet store. If you choose to purchase crickets in quantities of 1,000 or more, you need somewhere to keep them until you feed them to your pet. You can construct or purchase many different types of cricket house; regardless of the style chosen, the cricket house must be secure, clean and warm. Crickets are easy to house; many keepers use an aquarium or plastic tote box, though some choose to construct a wooden box. Wood has the benefit of being relatively inexpensive and easy to work with, but it requires the application a water sealant to repel moisture and resist decay. To build a wooden cricket box, construct a 2-by-4 frame, and enclose the box with quarter-inch plywood. Repurposed glass aquariums will also work for cricket maintenance, but they are heavy and fragile. Plastic totes are commonly used as they are inexpensive, light weight and easily cleaned. Regardless of the construction material, the cricket house will need to be big enough to house the crickets. As a rule of thumb, provide at least 2 ½ cubic feet of space for every 1,000 crickets. Additionally, include some crumpled paper or egg crate material to provide more surface area for the crickets to crawl on. Crickets are skilled escape artists; it is important that your cricket house securely contains the insects. With plastic or wooden cages, a tight-fitting lid is mandatory. As crickets are unable to climb glass, lids are not required when using aquariums, but they are still a good idea if you have other pets. Plastics vary in their texture, and crickets will be able to climb some tote boxes, but not others. Though they must be secure, be sure that ventilation is not compromised. The best solution is to cut several large holes in the lid or sides of the cricket box, and cover them with finely meshed window screen. 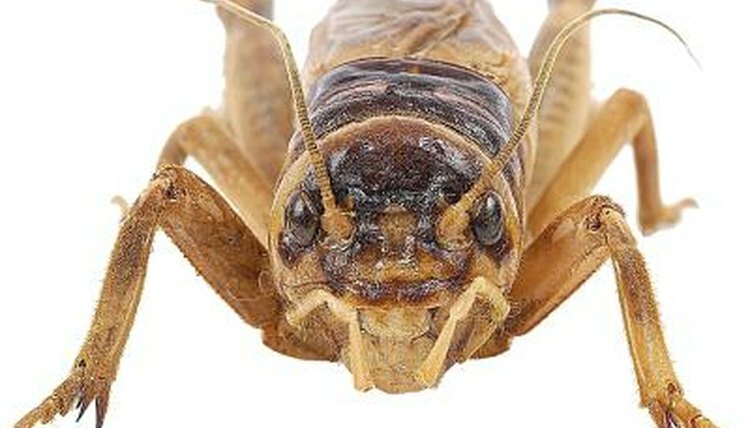 You must keep your cricket house clean to prevent pathogens or parasites from building up and killing your crickets. Always clean the cricket house with a pet safe disinfectant before you add new crickets. Crickets are very susceptible to chemical fumes and residues, so make sure you rinse your cricket house thoroughly before adding the crickets. If it is not possible to use water -- such as with wooden cages -- let the cage air out until you are sure that any fumes have dissipated. The optimal temperature for cricket maintenance varies based on their size; smaller crickets require warmer temperatures than adults do. Very small crickets -- called pinheads -- thrive at a temperature range of 85 to 90 degrees Fahrenheit. As they grow, their optimal temperature drops slightly, culminating with adults that thrive between 75 and 80 degrees Fahrenheit. If you are keeping multiple stages of crickets in the same area, it is best to provide them with a temperature of 80 degrees Fahrenheit. The ideal way to heat a cricket house is to keep it in a heated room. If that is not possible, heat tape or heating pads designed for reptile cages are the best option. Be sure to always check the surface and ambient temperatures of the cricket house and keep fire safety in mind. Wooden cricket houses will retain heat much more effectively than plastic totes, storage boxes or glass aquariums will.